Knowing The Raid from a friend of mine who recommend me to watch this movie. Screened at Jameson Dublin International Film Festival on 18th February 2012, Saturday morning at 11 a.m. Based on some experiences of watching Indonesia movies, I wasn't really enthusiast to go. But my hubby still encouraged me to go as according to his friend, The Raid has good reviews. Three reasons that encouraged me to go, its because Indonesian movie and I'm Indonesian, and because the good recommendation, and last was, Iko Ruwais, the main actor, and the director were presented after the movie. We arrived about 20 minutes before the movie started. Surprised by the fact that Garret Evans, the director and Iko Ruwais were there, standing not far from the locket ticket. They were surrounded by some fans, mainly Indonesian fans. My hubby and I didn't want to miss the chance to take photograph with the main actor, Iko. Again, we were surprised that the seats were full. Iko, himself and with the crew were sitting at the front. Myself and other Indonesians were sitting close to each others at the back seat. 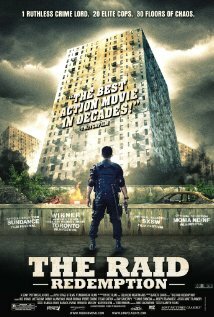 The Raid movie recites about team SWAT trap in a building where own by the big mafia. During 100 minutes of the movie, most of the time people were clapping and barrack. Some of 'Maluku' accent was the one thing that most foreign didn't understand why other people (Indonesians) laughed. A very tense action movie I have ever seen - but yet, I couldn't resist to keep my eyes open (my hubby surprised by the fact that I wasn't chill out during the movie). There was a question and answer session after the movie, according the interview with Garret Evans, the director, The Raid will be remade in Hollywood version (which most of people aren't happy to hear this) - and I believe the Hollywood version will not be good as the original one! There is also a rumor that Iko will be chosen as the main actor for the movie Mortal Combat which release in 2013. The great news for Indonesian people is, that The Raid won award as the best movie at the Jameson Dublin International Film Festival event! Two awards for the Raid in one go - well done!